Our Chicago commercial litigation attorneys realize that rapid technological innovation, mobility and the speed in which information is disseminated in commerce, has led business organizations, both small and large, to become increasingly concerned with protecting its intellectual property rights through restrictive covenants. In the employee and employer context, businesses struggle to keep their trade secrets concealed after employees leave to work for competitors or to start their own business. Both business organizations and Illinois courts recognize that employee knowledge and mobility increase the chances of trade secrets being misappropriated. Simply put, a restrictive covenant is a business agreement developed for an employee so he or she will not engage in certain post-employment activities. Restrictive covenants that limit or unnecessarily restrict post-employment competitive activities are disfavored in Illinois. There is a limited exception to this Illinois public policy, however, when the restrictive covenant is necessary to protect the legitimate business interest of employers or the entrepreneur. Whether the restrictive covenant was supported by valuable consideration. Illinois courts strictly construe restrictive covenants, such as noncompete agreements. For example, Illinois courts have found that non-competition agreements sometimes impose unnecessary retrains on trade and post-employment opportunities, thus the agreements are carefully scrutinized and strictly construed. Our Chicago commercial litigation attorneys realize that rapid technological innovation, mobility and the speed in which information is disseminated in commerce, has led business organizations, both small and large, to become increasingly concerned with protecting their intellectual property rights through restrictive covenants. The distinction between restrictive covenants connected with employment agreement or the sale of a business is significant because Illinois courts apply a stricter standard to employment agreements than they do to covenants ancillary to the sale of a business. The rationale behind the different standards is that “a purchaser in the sale of a business context holds more bargaining power than an ordinary employee in an employment context.” Thus, if a restrictive covenant not to compete is ancillary to the sale of a business, then the covenant must only be reasonable as to time, geographical area and the scope of the prohibited business activity. 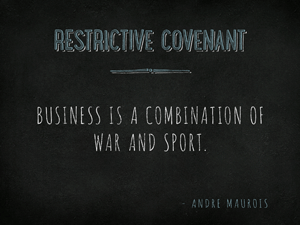 If the restrictive covenant is included in an employment agreement, however, the party seeking to enforce the restrictive covenant must show additional circumstances, such as a near-permanent relationship with his employee’s customers and that, but for his association with the employer, the former employee would not have had contact with the customers, customer lists, trade secrets or other confidential information.